Please read the "About Us"/ FAQ's prior to placing your order. We offer several options for 12", 10" and 7" vinyl. The old fashioned 7" comes in big hole or small hole. This listing is for small hole black with a choice of RPM and jacket style. (If you are unsure about RPM speeds please visit our FAQs on our main store page under "About Us"). Comes with poly-paper sleeve and ships with plain white label or choice of custom labels (see our store for options) and choice of jacket. We do not offer jacket art at this time but we will ship an extra jacket with the 7" for free (just ask) so you can experiment. After you order your receipt will give you directions on how to name, zip and upload your song files. You may choose a custom label after you order your vinyl. Please make sure you own legal copies of your song files. If you are in doubt we ask that you re-purchase them (Itunes preferred) prior to submitting your song files to us. We support recording artists and ask that you do too! This was so perfect and sweet! I ordered this for my husband as an anniversary gift, and I’m so excited to give it to him! It was delivered on time and they made sure to include a second jacket for me to customize. Thank you so much! Lived it! Excellent quality, got it a day earlier than expected. Absolutely Perfect and quick turn around time! Fantastic communication and great product. 100% recommend to anyone looking for a special gift. Every order is a custom product but if you have any special requests or specific questions regarding a short run or one off do not hesitate to contact us here on Etsy. We offer custom labels and jackets in our store for those who purchase a custom vinyl record. If you would like us to make a custom label or jacket for you and you have not purchased a record from us, please send us a Custom Order Request, let us know what you have in mind and we will get back to you shortly. What exactly is a lathe cut record and do they sound good? 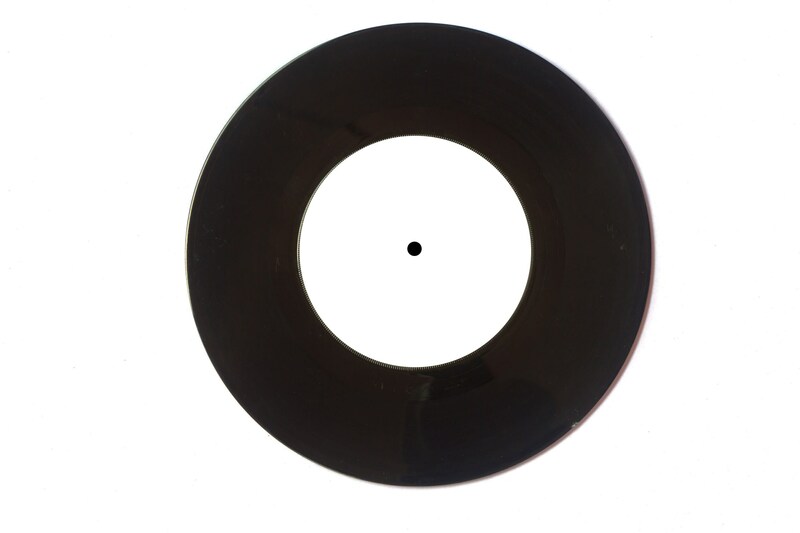 Every record that is made (pressed) is first lathe cut as a "master" and the short and easy answer is: we simply offer a lathe cut record as a final product. We do not press records. Please see our reviews re: sound quality. My playlist exceeds your MAX side length limit, what are my options? Consider ordering a double record set if you don't want to shorten your playlist. I make my own music and would like to purchase a short run (1-20) Can you do this and is there a price difference? If you are a recording artist or a label and have the direct rights to your music feel free to order one of the short runs we offer here on ETSY OR if you would like a shorter/longer run then contact us here and we can discuss your options. What files do you accept? What sounds best? iTunes has the best sounding files for our vinyl service. Apple Music files will not work. Any file that ends in m4p is copy-protected - please make sure your files DO NOT END IN m4p. Amazon and Google Play will sell you .mp3 files*. .mp3 is not recommended for vinyl. HOWEVER; please DO NOT convert mp3 or m4a files to .wav, .aif or flac. The conversion will NOT improve the sound of your mp3 or m4a files. *If all you have is .mp3 files than you can send them and we will cut them to vinyl. I just found you and need it really fast! Is this possible? We do offer a rush service for $30-$50 depending upon when you need it and the status of the queue at the time of your order. Expedited shipping is an additional cost. Please write us on Etsy letting us know where you are, what you would like to order and we will get back to you ASAP. Make sure and store your vinyl properly and that your record player needle is clean. If you have an automatic record player make sure and put it on manual when playing your custom vinyl record. What is the difference between a sleeve and a jacket? Many people confuse the SLEEVE for the JACKET. The sleeve slips over the vinyl and into the outer jacket. Anatomy of a record: vinyl (record) label (center "sticker") sleeve and jacket. I don't know the difference between 33 1/3 and 45 RPM. What should I choose? If you can't decide or don't know what player it will be played on then order the 33 1/3RPM which is most standard. Can you purchase the songs for me? YES, we can but ONLY if the songs are available in iTunes. Please make sure they are before purchasing your vinyl. 3) Send us a Custom Order Request letting us know you have ordered your vinyl and would like to us to buy your songs on Itunes (detailed instructions will follow). PLEASE USE COMMAS not dashes! Compilation 12" vinyl record, fully custom vinyl record in TEAL BLUE, up to 22 minutes and 6 songs per side, put your fav songs on a record!